﻿ Madam Ouspensky's talks to her pupils at Mendham - 1945 to 1947. Madame Ouspensky's talks to her pupils - 1945-1947 - now published! This book provides entirely new source material for the Gurdjieff Work. 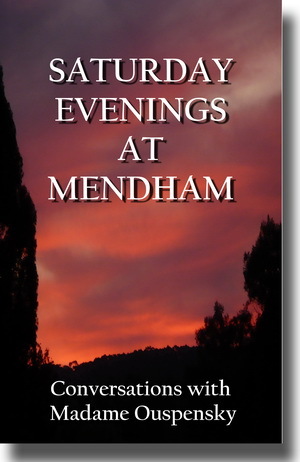 It is an authentic transcription of talks given by Madame Ouspensky to her group at Mendham, distilled from notes taken by her pupils at the time. Students of Gurdjieff's Fourth Way know little about Madame Ouspensky's thought or teaching because she left no written body of work—although some of her sayings were recalled by Robert de Ropp in his short account of his time with her. That has been virtually the only material extant. Until now. Now, an authentic transcription of talks given by Madame Ouspensky to her group at Mendham is published here by Buzzword. The talks, distilled from pupils notes, have been painstakingly compered and edited by the late Dorothy Darlington who spent years with Madame and Mr Ouspensky and who had a special affinity with Madame. Dorothy wished this part of Madame's legacy to be preserved. But, despite decades of prompting and submissions, no Gurdjieff Group or Group affiliated press has bothered to take the project forward. So, to preserve this account and to make it finally accessible to those studying Gurdjieff's ideas, we now issue this unique and priceless record as an ebook. Madame Ouspensky's place in Gurdjieff's System is relatively unknown. Her role was never publicized. People on the periphery were not even aware that her House in the country existed. For this purpose she organised a House for Work based on the principles laid down at the Prieuré. Here some people could live, others visit. To show people what they actually were and to fight on the side of the 'eternal against the temporal' was a task that aroused little gratitude in unprepared people or in those who defended and protected their little selves whose very life was threatened. But to those who really wished to see themselves—to see what IS—she gave inestimable help. I was present at her reunion with Gurdjieff at Mendham in 1948. It was as though they had never been apart. And because I was with her, he gave me some experiences that after the passage of thirty years are still vividly present. During this, his last visit to U.S., Gurdjieff told Madame Ouspensky: 'I need you to help me in my work for the next ten years.' He himself died the following year but she carried out his wish to her own final illness—just over ten years later. John Alexandra studied with both the Zen and Gurdjieff traditions and became an expert on comparative religion. His book attempts to de-mythologize approaches to self-awareness and self-transformation and to reveal the inner core of authentic systems of self-mastery. G. I. Gurdjieff's allegorical masterpiece, All & Everything has attracted many interpretations. This study is unique because it examines it from the autobiographical standpoint.The author believed that Gurdjieff used the Hermetic code in Beelzebub's Tales and demonstrated her theory by applying it as a key to the six 'descent' chapters of that book. Joy Lonsdale spent much of her life studying the Hermetic Code and corresponding with experts in the field. She attended a Gurdjieff group for years and was later a member of the Rosicrucians.